Along the Loire River Valley, the beautiful French countryside is studded with evocative châteaux. Home-basing in Amboise, we visit four unique castles: elegant Chenonceau, massive Chambord, stately Cheverny, and fragrant Villandry. Along the way, we tour Leonardo’s home, feed hunting dogs, enjoy the local cuisine, and savor a princely garden. With its huge scale and prickly silhouette, Château de Chambord is the most “must-see” of all the Loire châteaux. If you hate crowds, you’ll like Chambord. Because it’s so huge, it’s relatively easy to escape the hordes. It helps that there’s no one-way, mandatory tour route — you’re free to roam like a duke surveying his domain. This historic heap became the favored royal residence in the Loire under Charles VIII, who did most of the building in the late 15th century. Today, it’s worthwhile primarily for its terrific views over the town of Amboise, and the Leonardo da Vinci memories. In 1516, Leonardo da Vinci packed his bags (and several of his favorite paintings, including the Mona Lisa) and left an imploding Rome for better wine and working conditions in the Loire Valley. This “House of Light” is the plush palace where Leonardo spent his last three years. The house is a kind of fort-château of its own, with a fortified rampart walk and a 16th-century chapel. Two floors of finely decorated rooms are open to the public, but none of the furnishings are original, nor are they particularly compelling. Come to see well-explained models of Leonardo’s inventions, displayed inside the house and out in the huge park. Chenonceau is the toast of the Loire. This 16th-century Renaissance palace arches gracefully over the Cher River and is impeccably maintained, with fresh flower arrangements in the summer and roaring log fires in the winter. Chenonceau is one of the most-visited châteaux in France, and spaces are tight inside the château, so smart travelers plan around Chenonceau’s crowds. In high season, try to come early (by 9:00) or late (after 17:00). Avoid slow ticket lines by purchasing your ticket in advance (at area tourist information offices) or from the ticket machines at the main entry. On summer nights, floodlights and period music create a romantic after-dinner cap to your Loire day (gardens only). Across from the château entry, this Amboise restraurant serves tasty and well-presented traditional cuisine at fair prices. Choose a table outdoors facing the château or in the rustically elegant dining room. The snails are scrumptious, and the sauces are delectable. Several menus come with an amazing cheese platter. This stately hunting palace is one of the more lavishly furnished Loire châteaux. Because the immaculately preserved Cheverny was built and decorated in a relatively short 30 years, from 1604 to 1634, it has a unique architectural harmony and unity of style. From the start, this château has been in the Hurault family, and the charming viscount and his family still live on the third floor (not open to the public, but you’ll see some family photos). The château sits alongside a pleasant village, with a small grocery, cafés offering good lunch options, and a few hotels. Villandry is famous for its extensive gardens, considered to be the best in the Loire Valley, and possibly all of France. Its château is an average Loire palace, but the grounds — arranged in elaborate geometric patterns and immaculately maintained — make it worthwhile (and a must-see for gardeners). Still, if you’re visiting anyway, it’s worth the extra euros to tour the château as well. Hi, I’m Rick Steves — back with more of the Best of Europe. This time we’re enjoying the delights of the French countryside — it’s the châteaux of the Loire River Valley. Thanks for joining us. Awe-inspiring castles and palaces are scattered all over Europe. But no place is as renowned for its palaces as here — a region synonymous with châteaux — the Loire Valley of France. This time we start with the grandest of all châteaux, enjoy a river that marks the heart of France, play with Leonardo’s inventions at his last home, admire the ultimate in graceful palaces, feed the dogs, and eat well ourselves, before enjoying the garden of our dreams. France has historically been divided by the Loire River. The châteaux-studded Loire Valley is a two-hour drive south of Paris. Using the town of Amboise as our home base, we tour four unique castles: Chambord, Chenonceau, Cheverny, and Villandry. Because of its strategic location, the fertility of its land, and its long and involved history, the Loire Valley is home to a dizzying variety of castles and palaces. The earliest were designed purely for defense. But when a “valley address” became a must-have for France’s royalty in the 16th century, the old medieval towers were replaced by luxurious châteaux. The Loire River’s place in French history goes back to the very foundation of the country. 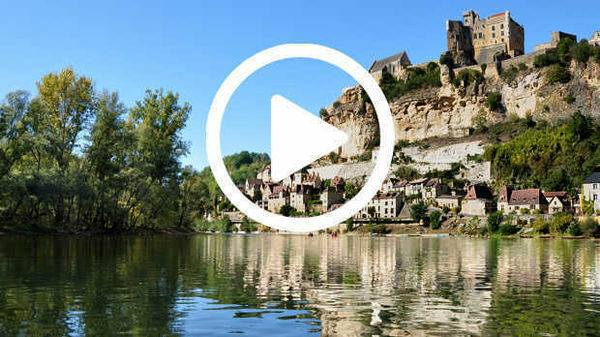 As if to proclaim its storied past, the Loire is the last major wild river in France. With no dams, it flows freely to the sea. We’ll start with the biggest. Chambord is the granddaddy of the Loire châteaux. Far bigger than your average Loire castle, it has 440 rooms, and a fireplace for every day of the year. It’s surrounded by Europe’s largest enclosed forest. It’s a game preserve defined by a 20-mile-long wall, and still home to wild deer and boar. Exploring the vast domain by rental bike, you can imagine royal hunting parties chasing their prey. Chambord began as a simple hunting lodge for bored nobles, and eventually became a monument to the royal sport and duty of hunting. Of course, when it comes to hunting, good horsemanship is an important life skill. Throughout the region it’s not uncommon to see horses prancing and dancing. Starting in 1519, the French king François I had this royal retreat built, employing 1,800 workmen for 15 years. François I was an absolute monarch — with the emphasis on “absolute.” In 32 years of rule, he never once called the Estates General — that’s the rudimentary parliament of old-regime France — to session. This immense hunting palace was another way to show off his power. The architectural plan of the château was modeled after an Italian church. It feels a like a place designed to worship royalty. This castle, built while the pope was erecting a new St. Peter’s Basilica in Rome, was like a secular rival to the Vatican. Like a cross crowns a great church, the tip-top of the tallest tower here is capped with the fleur-de-lis — symbol of the French monarchy. Each floor of the main structure is the same: four equal arms of a cross branching off of a monumental staircase, which leads up to a cupola. Grand après-hunting parties were held under these fine barrel-vaulted ceilings. Constructed for François I, his emblem — the salamander — is everywhere. The hunting theme carries on throughout the palace. This room features paintings and trophies from Chambord’s illustrious hunting past. Typical of royal châteaux, this palace was rarely used. Back then, any king had to be on the road a lot to effectively exercise his power. That’s why he’d have lots of royal palaces — and they sat empty most of the time. Back in the 1600s, Louis XIV spent a fortune renovating this place, and he visited only six times. Touring the lavish apartments of various kings and queens, you notice everything inside was designed to be easily dismantled and moved with the royal entourage. Because French kings moved around a lot, the entire court — and its trappings — had to be mobile. A royal château would sit cold and empty for eleven months out of the year, and then suddenly spring to life when the king came to town. The fancy spiral staircase continues to the rooftop terrace, decorated by a pincushion of spires and chimneys. From here, ladies could scan the estate grounds, enjoying the spectacle of their ego-pumping men out hunting. On hunt day, a line of beaters would fan out and work their way inward from the distant walls, flushing wild game to the center. That’s where the king and his buddies waited for the kill. The Loire River, gliding gently east to west, separating northern from southern France, has come to define this popular tourist region. The value of this river and the valley’s prime location, in the center of the country just south of Paris, have made the Loire a strategic prize for centuries — hence all these castles. This river has long been an important boundary in France. Over a thousand years ago, when the Moors invaded Europe from Northern Africa, this is as far north as they got. In World War II, when Germany invaded, this marked the border between Nazi and Vichy France. And even today, when people refer to northern and southern France, this river marks the border. Traditional flat-bottomed boats romantically moored along embankments are a reminder of the age before trains and trucks, when it was river traffic that safely and efficiently transported heavy loads of stone and timber. With the prevailing winds sweeping upstream from the Atlantic, barges, loaded with construction material for the châteaux, raised their sails and headed inland. Then, on the way back, boats flowed downstream with the current. This transportation infrastructure was critical for shipping all the necessary stone. And the region’s thick forests provided plenty of timber, firewood, and hunting terrain. It’s no wonder that castles were built on the Loire in the Middle Ages. Long before the pleasure palaces, this strategic valley was dotted with no-nonsense medieval castles. The royal connection with the Loire Valley goes back to the Hundred Years’ War — that was about 1350 to 1450. Because of a dynastic dispute, the English had a serious claim to the French throne, and by the early 1400s they controlled much of France, including Paris. France was at a low ebb, and its kings retreated here to the Loire to rule what remained of their realm. When the threat finally subsided, and the kings returned to Paris, many of their Loire castles became lavish country escapes. France rebounded and eventually tossed the English back to England. Still, the French kings continued to live in the Loire region for the next two centuries, having grown comfortable with the château culture of the region. The climate was mild, hunting was good, dreamy rivers made nice reflections, wealthy friends lived in similar luxury nearby, and the location was close enough to Paris — but still far enough away. For France, the 16th century was a kind of cultural Golden Age. With relative peace and stability, there was no longer a need for fortifications deep within the country. The most famous luxury hunting lodges, masquerading as fortresses, were built during this period. Extravagant châteaux like these didn’t come cheap. They were the fancy of the economic elites — insiders who controlled the workings of the French economy. Of course that all changed with the French Revolution, when the working class rose up, chased the bankers and financiers off their estates, and ransacked many of their palaces. Today scores of these castles and palaces have been restored, and are open to visitors. Modern-day aristocratic château owners, struggling with the cost of upkeep, enjoy financial assistance from the government if they open their mansions to the public. Straddling the Loire River, Amboise is an inviting town with a pleasing old quarter below its hilltop château. A castle has overlooked the Loire from Amboise since ancient Roman times. As the royal residence of François I in the early 1500s, little Amboise wielded far more influence than you’d imagine from a lazy walk through its pleasant, pedestrian-only commercial zone. The busy, pedestrianized Rue Nationale survives from the 16th century. Back then, when the town spread at the foot of the king’s castle and was the second capital of France, this was its main drag. The château of Amboise was the favored royal residence of several kings. Today visitors can stroll through its peaceful grounds and enjoy commanding views. Here in the Loire, you’ll notice the impact of the Italian Renaissance. When French big-shots traveled to Italy, they returned inspired by the art and architecture they saw. Tastes in food, gardens, artists, and design were all influenced by Italian culture. And François I did what he could to physically bring the Renaissance to France. It just made sense: The ultimate French Renaissance king invited the ultimate Renaissance Italian artist, Leonardo da Vinci, to join his court. The king set Leonardo up in Clos-Lucé — a small mansion, just down the street. In 1516, Leonardo da Vinci left Rome, accepted the position of engineer, architect, and painter to France’s Renaissance king, and moved in. The 64-year-old Leonardo spent his last three years here, in the court of 22-year-old François I.
Clos-Lucé thoughtfully recreates the everyday atmosphere Leonardo enjoyed while he lived here: the great hall where he received VIP guests, his bedroom, and the fine kitchen, which came with a chef provided by the king. Enjoying the patronage of the French king, Leonardo pursued his passions to the very end. This romantic painting shows François I comforting his genius pal on his deathbed. Clos-Lucé displays models of Leonardo’s remarkable inventions, built according to his notes. Leonardo was fascinated with water, and was brilliant in harnessing its energy. The château’s grounds are a kid-friendly, interactive park with life-size models of the clever contraptions Leonardo dreamed up. While parents relax, kids spin the helicopter, raise heavy stones with innovative gear systems, pump water upward with an Archimedes screw, ponder tanks and machine guns, and propel boats with paddle power. The pastoral Loire Valley hides countless castles (or “châteaux”). While you’ll likely visit several, it’s important to choose wisely. Rather than seeing a string of similar palaces, we’ve lined up a variety — several distinctly different châteaux. While Chambord was grandiose, our next one is graceful. The château of Chenonceau is the toast of the Loire. This 16th-century Renaissance palace arches gracefully over the Cher River. Its formal garden, combined with the delightful riverside setting, makes it one of the great sights in all of Europe. The palace is lovingly maintained with bouquets of fresh flowers adding fragrance, and an included audioguide making sure visitors understand what they’re looking at. Big fireplaces warmed big beds while portraits of illustrious owners give the place a certain pedigree. While the tapestries kept the rooms cozy, they also functioned to depict recent history — to the king’s liking, of course. These 16th-century tapestries are among the finest in France. Chenonceau was the first great pleasure palace. With its ravishing grand gallery spanning the river, it was designed for high society. Nicknamed the “château of the ladies,” Chenonceau housed many famous women over the centuries. In 1547, King Henry II gave the original castle to his mistress, Diane de Poitiers. She added an arched bridge over the river. When the king died, his wife, the queen, Catherine de’ Medici, took over the château. She threw out the mistress, converted Diane’s bridge into a fancy ballroom, and, according to legend, put her own portrait above the fireplace of her rival’s bedroom. Big personalities like kings tickled more than one tiara at a time. Mistresses were a routine part of the mix. Louis XV decorated this palace with a painting of the Three Graces — featuring his three favorite mistresses. Now that’s the arrogance of power. A powerful queen or mistress often managed to get her own private palace, even when the king’s romantic interest shifted elsewhere. In many cases, the king or nobleman would be away on work or at war for years at a time — leaving home-improvement decisions up to the lady of the château, who had an unlimited budget. We’re back in Amboise. And a day of château-hopping puts me in the mood for an elegant meal. My friend and co-author of our France guidebook, Steve Smith, is joining us — as is so often the case — just in time for dinner. The rustic yet elegant L’Epicerie serves delicious and well-presented traditional cuisine, and is a hit with locals. Its tiny kitchen manages just fine. Rick: Tell me what you’re having and why. Steve: I ordered shrimp from the Loire River — so it’s freshwater shrimp — with tapenade. Rick: Tell me about this: escargot. I love it. Steve: Escargot is famous in Burgundy — that’s where it started. But it became popular. Every region in France seems to do an escargot. Rick: The rosé is refreshing, isn’t it? Steve: It’s summer, August in France, we drink rosé. Rick: Even escargot, red meat? Rick: Oh, here we go…what do we have? That one for there. And I will take this one. Oh! Rick: Thank you. Steve, these are classic dishes. Steve: Yeah, you have lamb. I have duck. Rick: Yeah, duck seems to be pretty common in France. Steve: It is — it’s on every menu. It’s normal. It’s like the chicken of France, really. Rick: But when you look at the price, it’s not that cheap. Steve: You’re right, in a sense, but it includes tax and tip. That adds up to about 25 percent. Rick: People should remember that when they’re ordering. Aurora, the restaurant’s owner, enthusiastically introduces us to her cheese course. Aurora: Hello, you have a local goat cheese, all right? You have the Sainte-Maure de Touraine, Selles-sur-Cher, Valençay, and Pouligny-Saint-Pierre. After, you have some cow cheese. I have just one local cow. It’s creamy and soft, and it’s from the Loir-et-Cher département. The name, the Dreux. You have stronger than, but creamy too, with the Langres from Champagne. If you like from Savoie, you have the Reblochon. From the north, you have Maroilles. Pont-l’Evêque, Normandy. Saint-Nectaire, Murol, and Fourme d’Ambert blue cheese from Auvergne. Rick: So, you have goat cheese and cow cheese, and it goes from mild to strong, and it’s like a map of France. Aurora: Mm-hmm, yes, exactly. You visit different regions. Rick: Le fromage, vin rouge, et pain — it's beautiful. Every place we’re visiting is within an hour’s drive of our home base in Amboise. The drives are so scenic, you almost wish they were longer. The stately hunting palace of Cheverny is immaculately preserved. Because it was built and decorated in just 30 years, in the early 1600s, it offers a pleasing architectural harmony and unity of style. The château has been in the same family for five centuries, and the intimate details, like the wedding dress in the bedroom, are a reminder that the marquis lives here to this day. Formal rooms like this, with a fine 17th-century painted ceiling and centuries-old suits of armor, feel like museums. But, upstairs, the family quarters feel more lived in. The library shows a love of music and culture. The children’s room features toys from the 19th century. And this clock does it all, showing the stage of the moon, day, and date. Its second hand has been ticking for 250 years. When the Revolution hit, in 1789, many palaces were trashed — some were even burned to the ground. But many survived. Some were lucky. Some had fast-talking owners with friends in high places. And others, like Cheverny, had a reputation for being good to their workers. And back then, a big part of château life included hunting — and still does. The marquis hunts twice a week in season. Feeding time for his hounds is 5:00 daily. The hounds — half English foxhound and half French Poitou — get worked up knowing red meat is on the way. The master moves them out, and spreads out the feast. The excitement is palpable. The trainer, who knows each of the 70 dogs by name, opens the gate and maintains discipline as the dogs gather at the concrete table. It’s an exercise in canine control. Finally, he gives the signal…and its chow time. The Loire, nicknamed “the Garden of France,” is blanketed with fertile farmland and dotted with historic farms. A short drive takes us to our final château. Châteaux all have impressive grounds — but one’s a destination specifically for its landscaping. For my favorite gardens in the Loire, it’s gotta be Villandry. Finished in 1536, Villandry was the last great Renaissance château built on the Loire. And all the attention here is on its grounds — arranged in elaborate geometric patterns and immaculately maintained. It’s a hit with gardeners. Like so many châteaux around here, this was the pet project of a fabulously wealthy banker — Jean le Breton who worked for the king, François I, in the early 1500s. Well-traveled Jean was inspired by Italian Renaissance gardens. So, when he built his château, he created this. The 100,000 plants — half of which come from the family greenhouse — are replanted twice a year by 10 full-time gardeners. Posted charts and maps identify everything in English. The place is lovingly manicured. Stroll under the grapevine trellis, through a good-looking salad zone, and among Anjou pears. The earliest Loire gardens were practical, grown in the Middle Ages by abbey monks who needed vegetables and medicinal herbs. And those monks liked geometrical patterns. Later, Italian influence brought decorative ponds, arbors, and fountains. And harmonizing all the elements was an innovation of 16th-century Loire châteaux. Today’s beautiful gardens at Villandry — a careful reconstruction of what the 1530s original might have been — are the result of generations of passionate dedication. The châteaux of the Loire Valley have been shaped by the ups and downs of French history. From defensive forts to luxury hunting lodges, to the target of angry revolutionaries. Thankfully, many survived the tumult of the age and have become appreciated as icons of French heritage. The Loire Valley, with its historic châteaux, has found a place in our collective hearts and is treasured by those who visit to this day. Thanks for joining us. I’m Rick Steves. Until next time, keep on travelin’. Rick: So, when it comes to the menu? I can help your army by designing flying machines, tanks, gear systems, water pumps, and rapid-firing guns. Rick: So, perhaps your great-great-great-great-grandfather used this as a den chair. Viscount: No, because — it’s a secret: it’s a new one.